After Alex Jones was effectively banned from the internet — or at least his major distribution channels — last August, it appeared that we’d be rid of his half-baked conspiracy theories once and for all. Or, that’s what we thought, anyway. Following multiple “strikes” for content that violated its terms of service, YouTube permanently removed Alex Jones’ InfoWars channel last October. Gone are thousands of hours of archived content, more than 2.5 million subscribers, and the ranting diatribes of the internet’s most marketable villain — now that Martin Shkreli has stepped out of the public eye while appealing a seven year prison sentence, anyway. It didn’t take long for Jones to feel the heat from the rest of the internet’s major players, including Apple, Facebook, Twitter, Spotify, and a handful of others. Each banned Jones, and InfoWars, permanently, from their respective platforms citing reasons ranging from simple terms of service violations, to actively inciting violence or promoting hate speech. But regardless of their actions against him, Jones is proving resilient, like a digital cockroach. On YouTube, at any given time, there are a half dozen (or more) livestreams of Jones’ daily InfoWars broadcasts. Each runs concurrently, closely mirroring the content on the InfoWars homepage — although some are on a slight delay. On Facebook, it took less than 60 seconds to find a handful of InfoWars livestreams, including multiple pages that make no effort to hide their purpose, stating proudly that they exist to further the Jones agenda through live, and archived InfoWars content. Try as they might, tech’s titans can’t seem to contain the fire that is InfoWars. They’ve cut off distribution, or so they thought, but few platforms seem motivated to enforce their own rules as it relates to banned content and intentional circumvention of said bans. All users agree to comply with our Terms of Service and Community Guidelines when they sign up to use YouTube. We review flagged content and remove it when it violates our Guidelines and apply a strike to the account. When users violate these practices repeatedly we terminate their accounts. Boilerplate. Alex Jones, though, was subjected to a ban of this nature. 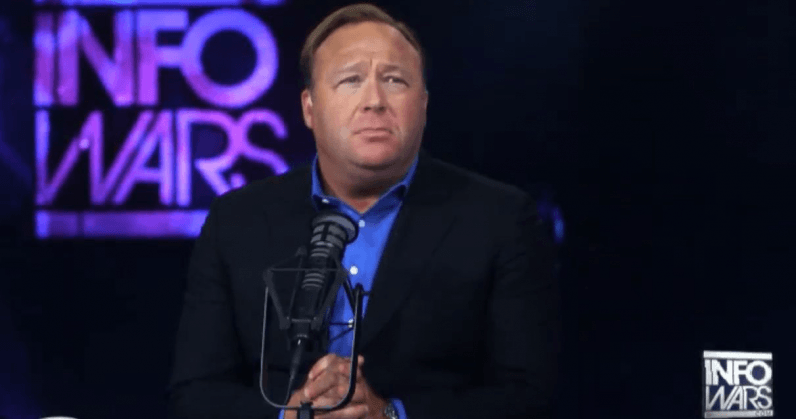 On July 24, 2018, The Alex Jones Channel received a strike for four videos that YouTube moderators felt violated the platform’s policies against child endangerment and hate speech — InfoWars’ Sandy Hook conspiracy theory that no children were harmed and that the event was a false flag using crisis actors, among other things. He lost the ability to stream content for 90 days. After a slap on the wrist in July, he was banned for real in August after YouTube learned of Jones’ attempt to circumvent the ban by promoting InfoWars content on other YouTube channels. Now we appear to be at an impasse, a repeat of the Jones saga that turned his suspension into a permanent ban. Only this time, there’s no meaningful recourse for YouTube. Losing an account with thousands of hours of archived content and a subscriber base of 2.5-plus million is a major blow in terms of content distribution. Losing a channel that co-opts InfoWars branding, lacks any real subscriber base, and could just as easily show up tomorrow with a different URL, barely registers as a hiccup. As for Facebook, we were told (I’m paraphrasing a longer conversation) that the accounts streaming InfoWars programming weren’t in violation of the rules, since the action was taken on Jones’ accounts, specifically. The explanation sounded suspiciously like that of a company willing to take action on a public figure after public outcry, but less concerned with policing smaller, less notable accounts publishing the same content. That leaves Facebook, Twitter, YouTube, and others playing internet whack-a-mole, pounding on the heads of new accounts until the problem goes away, or the platforms are no longer interested in playing. And we could be reaching that point. Many of the accounts are operating in the clear, not even attempting to hide their actions while openly mocking the lack of enforcement activity by the platform it’s hosted on. Facebook, specifically, seems to have abandoned the notion of enforcing its rules on merit, rather than as a response to public outrage. If horror movies taught me anything, it’s that you always make sure the villain doesn’t come back from the dead for one final scare.